With CoinBase wallet, traders and investors can take advantage of this secure and Segwit supporting platform to store their stash including Litecoin (LTC). Meanwhile, it is after prices cross the $50 mark that risk-averse traders can ramp up with first targets at $70 and $110. 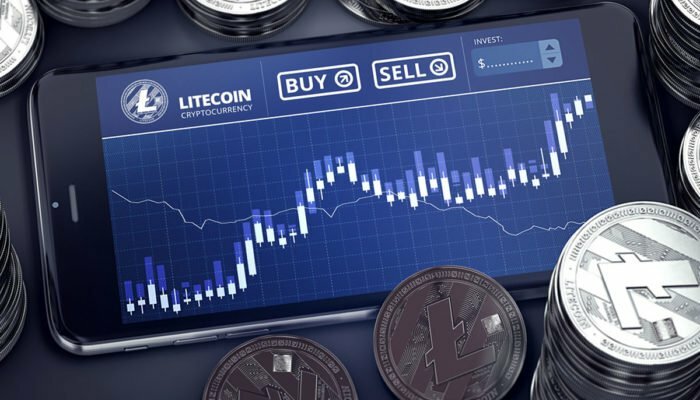 Competition for dominance just got stiffer: CoinBase wallet, a hot wallet, that describes itself as the “world’s leading user-custodied crypto wallet” now supports Litecoin (LTC). Complete with a multi-coin feature, the inclusion of Litecoin is a step in the right direction and points to underlying demand from users. Litecoin complements Bitcoin and is the fifth most valuable coin in recent rankings thanks to their stellar performance in the last three weeks. At the time of press, the currency was up 19.9 percent in the previous week, and the new support is a reprieve for investors as well as traders seeking a safe abode against marauding hackers. The wallet supports “newer Segwit address formats for lower miner fees, as well as Legacy addresses for backward compatibility in all applications.” Besides, they have top-notch security in place. Apart from encrypting private keys on the user phone, CoinBase wallet incorporates Secure Enclave meaning the exchange’s reputation will remain intact as they bring to use the best-in-class security feature to safeguard user funds. In other news, Jack Dorsey—who together with Charlie Lee and other interested parties invested $2.5 million in the Lightning Network—is using the Tipping Browser Extension to receive LN tips. Increase usage of the new scaling solution will inevitably lead to demand in Litecoin as the network’s LN mirrors that of BTC and gain momentum. At spot rates, Litecoin (LTC) is up 18.3 percent and a few cents from breaching the $50 resistance level. Like in all our LTC/USD price analysis, the reaction at $50 will determine the medium to long term trend. It will be more so if buyers build enough momentum and close above $50 at the back of high trade volumes in a reflection of Feb 8 and Feb 18 upswings. In line with our trade plans, every dip will technically be a buying opportunity, and as long as prices are above $35, bulls have the upper hand. 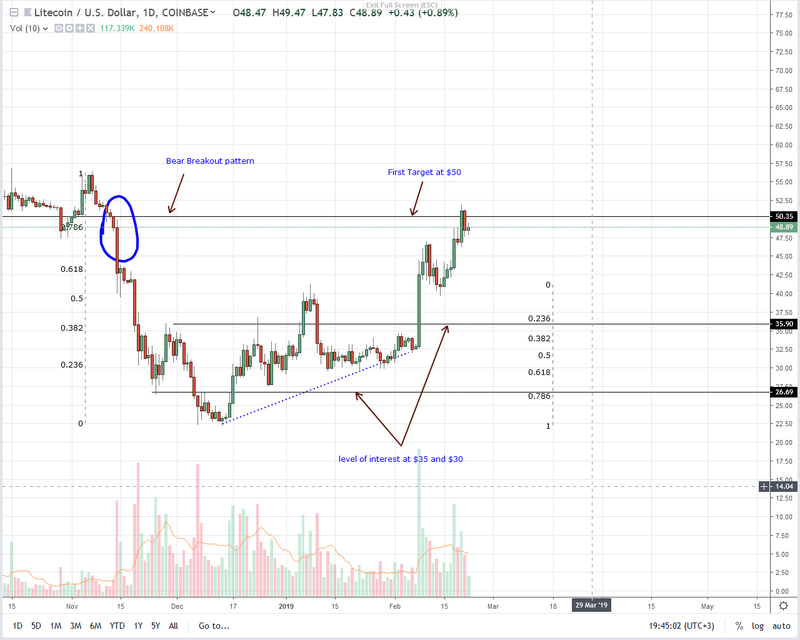 Once there is a rally above $50, the bear breakout pattern of early Nov 2018 will be invalid as Litecoin (LTC) bulls take control, driving prices to $70, $90 and later $110. After two weeks of bulls’ resilience, LTC is now retesting the $50 resistance mark. We are net bullish, and our reference bar is Feb 8—832k against 202k and Feb 18—522k versus 262k. Despite buyers, we need a solid breakout, and the only demonstration is if there is a high-volume bar breaking above $50 with above-average volumes ideally exceeding 522k on the lower side and 832k on the upper hand.